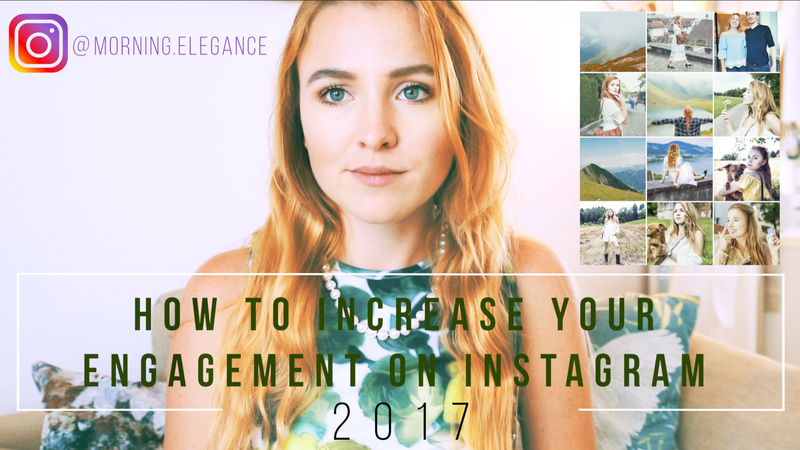 How to get more Followers and Engagement on Instagram in 2017! Hi guys! I started my Instagram Channel @morning.elegance in 2013 and I have been posting ever since. 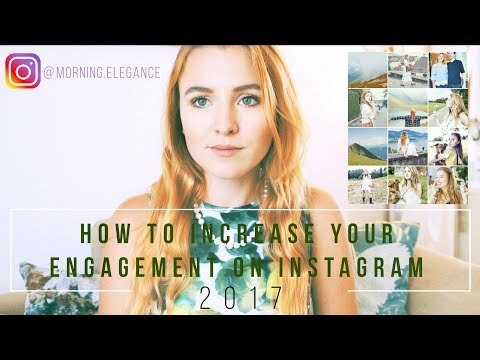 How to get more Followers and Engagement on Instagram is one of the Questions that my Followers ask me the most! So I wrote down my own 10 Tips for you to grow your Instagram channel today! When you do your research you really have to focus on the fact that a lot of tips on how to grow your engagement on Instagram are not up to date anymore and I know this as I have been doing it for nearly 4,5 years now! I hope you will also watch the video as I will give you a little bit deeper information in it 😉 Don’t forget to subscribe or give me a like. When my video get’s to 30 thumbs up I will do another video for you guys to help you achieve your dreams! This one I have just learnt after finishing dental school as before I just couldn’t really do it. After I was being consistent for nearly 8 months I realized what I have been missing before – A TRUE FOLLOWING! The people that follow you want to be a part of your everyday life. So you have to be there for them EVERY SINGLE DAY! You should analyze your followers and figure out two times a day when you should post. The first time is good to use when you are a smaller Instagramer so that all of your followers are active and actually might see your post and the second time is for when you try to get into the popular posts section so that new people can see you. As I told you before a lot of people want to be part of your everyday life so it is best when you post as much as you can. But you should make sure that you don’t spam the people either. With Instagram Stories you can give your Followers the quantity they want but you don’t have to give them the quality content that you have to put onto your feed. Go through your posts and see which of them get the most interaction then try to do posts like these more often! When I started out, Hashtags were really important and you had to be very careful with which you should use as back then #girl meant that there was actually a girl in the photo. Today this doesn’t really work anymore. I know that Instagram really tries to go back to Hashtags being real which caused the so-called „shado-ban“ to happen. Consequently they banned a few hashtags so you won’t find pictures under #humpday anymore. So what I am telling you is that you should try to figure out the best hashtags to put on your pictures and then post as many as you can because this will still give your pictures a much bigger reach possibility. By this I don’t mean that you have to use the same filter over and over again but you should try to stay in your preferred color-scheme and you should also decide if you want to post light pictures or darker ones. Don’t switch back and forth as this won’t look good on your feed! A clean and well thought through feed will help people to know what to expect from your channel so they will most likely hit the follow button, if they like what they see!! Tag the brands you are wearing as this will help you reach more people through the tagged section of the brand. Maybe they will even repost your picture which again gives you a much bigger audience. Or if you are really really lucky they might even want to work with you!! The more likes and comments you make the more you get back. That is why so many people were using Robots to like for them as this is a lot of work if you want to do hundreds of likes daily but Instagram again is trying to kick all the Robot-Programs off their platform. So do it manually as much as you can and in the right section and don’t be afraid to follow people a lot of people will even follow you back! Don’t go around being a lone runner! You have to get out there and write genuine comments or even leave a little smiley or heart. For example I am always going back to the people that commented on my pictures and I will always give them a couple of likes or a comment back as I really am so happy for everyone that is taking their precious time to write me a comment. When I first joined a „Blogger-Pod“ I was so happy that we were back where I was in 2013 and that people actually genuinely followed along what the others in the group were doing but soon I realized that it wasn’t what I expected. Most of the people in there got really mad, when you weren’t able to like at the same day when their picture was posted, or that you didn’t write a long enough comment under their picture!! So I started to think about if I really wanted to be part of this group or if I actually would rather genuinely like and comment to their pictures and not be forced to do so. So I told them that I would leave the group I have to admit that it made my decision much easier once I heard that it is actually forbidden to have these pods on Instagram. Still I am not sure if this is a rumor or not! Oh, and being in one of those Pods is waaaay tooooooo much work!! You have to think about the fact that you are in a group with 15 girls that post at least 2 times a day. So think about some amazing comments to write and you soon won’t be doing anything else. Nevertheless I am still part of one group of 4 Bloggers on my Instagram and I really enjoy this group. The ladies in this group are lovely and we support each other as much as we can. The group works just like a little reminder to one another to have a look at each others pictures and talk about the latest Instagram rumor you heard. I really enjoy this and I hope that there are more Bloggers and Instagramers out there that think the same way. Then these, I would much rather call them „groups“ are a great thing to meet and get to know fellow bloggers and to support each other. I really hope I can help you with this post and I would love to know if you guys would like me to write more Blogposts about Blogging and Instagram Tips for you! Don’t forget to come by my Instagram Account @morning.elegance or subscribe to my youtube channel for more videos like this! Nächster Beitrag 5 Tips: How to appreciate your Life!